This is another device in the mid-tier: value-against-features playground. The G6 (without the Plus) feels just a little bit too much like low-end to me, but I’m sure it has its fans. I tend to only really take seriously Android phones with (equivalent or above) Snapdragon 600-series chipsets. There was, however, a temptation to compare this phone with the other G-series handsets and various Chinese offerings from Xiaomi and Honor and so forth, but I think that I’d rather pitch it against the Nokia 7 Plus now that it’s under £300, on grounds of specs and performance - and maybe the Moto X4 as it seems to take design cues left, right and centre from its Moto sister. I have the Moto Z2 Play here too, of course, but because of the Moto Mod System integration, the Moto G6 Plus really isn’t in the same catchment area as this, though I will, no doubt, make reference to that device along the way as it’s a year old, Z3 Play pending, and to some degree it may be good to note some of the differences not related to Mods. The G6P is currently available for officially £269 in the UK, but £230/240 can be found. Motorola/Lenovo do the same annoying LG trick of making different versions of the device for different markets and make it difficult to get preferred variations if you’re in the wrong patch. The one I would have preferred here would be the version with 128GB of storage and 6GB RAM, but it seems that this is reserved for other countries. It’s assumed, I guess, that everyone in The West sits in unlimited connectivity the whole time. Anyway, this gripe aside, I have the 64GB/4GB version in Deep Indigo, though again, depending on where you live, there are Gold and Nimbus colours. I think Nimbus is some sort of battleship grey! One of the ways in which the Nokia is set aside from the G6P here is in the use of metal for the frame. The Moto has a plastic perimeter, but unlike the Nokia, is then sleek glass on front and back. The Nokia has 6000-grade aluminium through the sides and back, with soft-touch coating, though actually, it’s largely psychology - as everyone’s going to use the supplied TPU in both cases. Talking of which, the Moto was a first for me in that the phone in the box on opening, factory sealed, had the clear TPU in place around it. The case is actually not great and for a fiver, I got a much better one. The styling of the G6P is very much like the Moto X4 - it’s a bit spooky really. The way in which the curves of the glass front and back meet the edging and the very similar camera ring on the back, it all looks like a clan. Where the two devices are clearly different is that the X4 has a 5.2” 16:9 screen and the G6P a 5.9” 18:9 one. The choice of screen has been a 1080p IPS LCD and, as I say, it’s a 18:9 ratio, which is the first time Moto has swayed itself away from 16:9. I didn’t think they needed to, personally, but it’s all the rage. Fortunately they’ve drawn the line (literally!) at inclusion of a Notch and the corners of the panel are very slightly curved, more subtly than the Nokia’s. The Nokia has a 6” screen, still 18:9 but they’re all but the same size in height (due to the front-facing fingerprint reader on the Moto’s chin) and width. Gorilla Glass 3 is employed front and back, but you really need that case! The Nokia is certainly boxier than the Moto as the latter follows the Moto trend of rounding the actual corners of the device itself rather than (all but) squaring them off. They’re about the same thickness, too, though the Moto’s camera island does stick out somewhat in comparison. Another reason to use a case, as the amount by which it sticks out is really quite marked. Both devices feel substantial in the hand, are weighty and neither conjure up anything other than a premium feel. LCD screens on phones these days seem to just get better. I wonder if this is the end of OLED on phones really. The Sony Xperia XZ2 and XA2 I reviewed recently had similar commentary. They are bright, vibrant, rich and colourful. This Moto doesn’t reach the heights of the latter’s Triluminous glory, but it really is very good - and the brightness is incredible, especially on auto. Very bright, challenging even the Nokia 8. No problems in the sun with the G6P. The user can also switch between Standard and Vivid to choose ‘as the eye sees’ and a more saturated colour palette. The Moto lags behind the Nokia in the chipset stakes, settling for a Snapdragon 630 instead of 660. The same 4GB RAM are present on both and if we’re being picky and holding the two side-by-side, yes, the Nokia gets there first in most launches or switches. But the context is that it’s nanoseconds. You really do have to be picky. But if you’re looking, it’s there. If that’s going to annoy you then the Nokia would be the choice. Fortunately, the Moto gains points elsewhere to balance the books. The Moto is p2i interior component nano-coating ‘splash resistant’ (and I’ve seen YouTube videos of people submerging the device in clean water for a few minutes, which it survives). The Nokia boasts nothing of the sort. Fast updates to an OS has become very important to many and AndroidOne devices are right up there with the first wave of recipients of the latest and greatest after Pixel. The Nokia benefits from this and my unit here is currently on Android 8.1.0. and July 2018 Security, awaiting August any minute. Users won’t get the same level of attention for the Moto units, this, and the Moto Z2 Play alongside, sitting on 8.0.0. and June security. The X4 is (in the USA) a part of the AndroidOne programme and will get in there along with the Nokia. When and if Moto decide to update is anyone’s guess. With Android Pie now in devices, it does make you wonder - and the confidence will be with the Nokia owner here over the G6P. The trend these days is to go for 64GB of storage in Android devices in the mid-tier and both of these are compliant. The X4 only has 32GB but all three have microSD Card slots for more memory, so there really shouldn’t be concerns about getting all your apps and services on any of these, at least for the time being. I do get a bit twitchy when my 32GB devices are 75% full, but to be fair, I haven’t run out yet - by sensible allocation of data. This UK G6P is a Single SIM version - which is very obvious when the tray is removed as it’s really tall! There’s a plastic block in the middle where the second SIM Card goes in some markets, which means that they will benefit from two SIM Cards and the microSD Card slot. Not a given, when so many make the user choose. Nokia have chosen to mount the fingerprint scanner on the back whilst Moto have gone for front-mounted and chin. 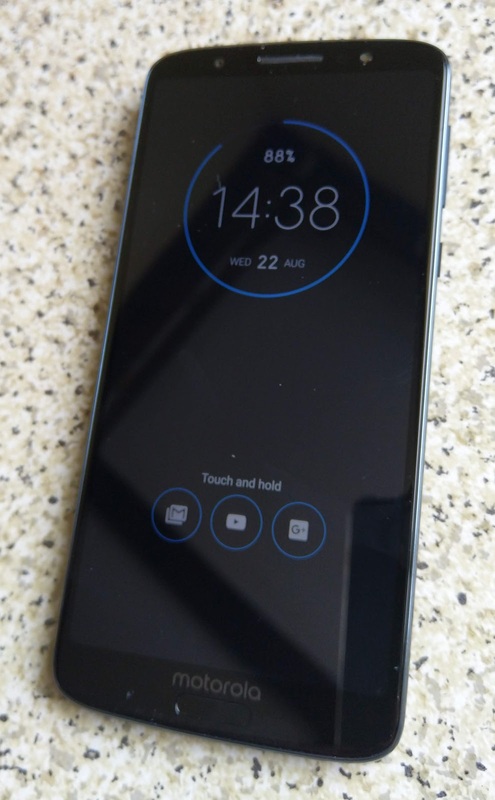 It’s a very thin sliver of a pill-shaped sensor too - they seem to have sacrificed the nice big sized version used on the Z2 Play and X4 so they could squeeze in the 'motorola' logo between it and the screen! Very silly. And the big one on the others worked so well. Or why not just put it on the back, I wonder. It does have advantages on the front for desk/table use of course, but it’s a shame it’s not bigger. I wonder if they’ve made it like it is so as to be in keeping with the style of Pie and Pixel Navigation options. One of the Moto Actions is already to choose to get the controls off the screen and use the ‘pill’ for swiping, so logically, should Pie arrive on this, the scanner would be ready to go in the same fashion. I still say it would have been better on the back. Talking of the back, it’s all glass but at this price-point there’s no wireless charging of course. The 3200mAh battery is housed in there serviced by the bottom-facing USB-C port. There’s a 15W TurboCharger in the box, which is a nice touch, and QC4. So charging up good’n’fast. I was concerned about the battery at 3200mAh having now got used to the two-day Nokia - and with no Moto Mod to fall back on - but I needn’t have worried. The battery, like the XZ2 I mentioned earlier, performs amazingly well. Something’s going on with batteries these days - every new device I review, I just seem to wow about - despite the specs reflecting a lesser output. First 3/4 days here and it’s returning 40hrs between charges with 6-7hrs SoT and 25% brightness. Not quite matching the 4000mAh of the Nokia, but going by the figures and capacity difference, staggeringly impressive and not far away. One of the main attractions to me regarding this device was what was being said about the speaker and the deal that had been done with Dolby for the inclusion of a true system-wide sound manipulation tool. Unlike the Xperia which isolates the controls, this emulates at least a part of what Dolby Atmos does in the Razer, with the sound control sitting over and above anything you’re doing with the device instead of being only available to certain apps. Dolby Audio is a separate app and can be launched at will and switched on/off. Applications default to the controls and there is a genuine difference to be heard when employed. The sound is louder, richer and better than every device I have to hand, all the Nokia models, the other Moto models (including the Z range) and Sony ones - excluding, of course the Razer/Marshall. Even when the Dolby is switched off, it’s still ahead of most, on most grounds. A fabulous performance. There’s also a 3.5mm audio-out socket and the sound coming from there testing with my reference headphones sounds fabulous, Dolby controls available throughout of course. There’s no earphones in the box, which is probably a fair idea as people will want their own anyway, generally, and it might have shaved a tad off the price. There’s a recordable FM Radio included along with Bluetooth 5 connectivity standards for hooking up other gear. I’m really impressed with the sound! 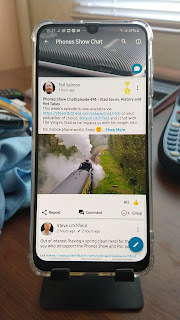 Software is held to a minimum, Moto infusing the experience with their genuinely useful additions on top of Vanilla Android and none of it gets in the way of feeling like one is experiencing Android as intended. The two exceptions to this were also present on the Moto X4 - Outlook and LinkedIn. They can both be disabled (though not uninstalled) and I remain as foxed as I did when reviewing the X4 as to why those two were isolated for inclusion and can only think that it’s something to do with the USA market and AndroidOne. Mystery. But it doesn’t spoil the party and unlike many others the device is not littered with bloat and junk to deal with. The Nokia 7 Plus is obviously even cleaner, but you don’t get some of the useful additions which Moto offer. The Moto Voice is pretty pointless really and stands out as the one addition which the user wonders ‘why’ about when Google’s own Voice functions and Assistant are so good and available on the device anyway. Moto did toy with including Amazon Alexa stuff for a while, but although this is still a downloadable app, it’s not baked in. Perhaps they thought better of it! The rest of it enhances the experience in the usual ways. The virtual always-on screen which needs the wave of a hand over the phone to show content, lighting it up when notifications arrive and offer the (uneditable but attractive) circle of battery state, date, time and so on. It’s a brilliant system only bettered by truly always-on, and one which I remain unclear about as to why it’s not been emulated elsewhere. Then there’s the usual raise to check, double-tap to wake, press fingerprint scanner to turn on and off, chop-chop for torch, twist-twist for camera, night display controls, power controls, Moto Key for remote logins, 3-finger screenshot and so on. The face-unlock function, like others I’ve tested with my full-face beard, just doesn’t work! It won’t let me register my face. End of! So I’ve no idea if it works. As I’ve said in other reviews, it seems like a dead-loss if everyone in the world with a full beard can’t use it! Anyway, I’ve covered all this stuff before in other Moto reviews so won’t do it again. It’s all familiar and mostly provides for useful additions. The bad news about the camera is that there’s no OIS anywhere. There is EIS, however, and in my testing here the camera does a fine job even in low light. The 12MP sensor with f1.7 aperture captures things in all but very dark scenes. There’s secondary 5MP camera in the rear cluster with an f2.2 aperture which functions as a depth sensor for de-focusing effects which we’re now coming to expect in our phones’ cameras. Video can be captured in 4K at 30fps. Seems pretty stable on testing even without OIS. There’s a 8MP Selfie around the front which they’ve also included a secondary LED flash for capturing one’s mug! More importantly for the target audience here is the fun that can be had with the cameras with various modes and functions. We’ve seen Spot Colour before in the X4 and coming to the Z3 Play, where a single colour can be isolated in a scene while the rest of it is shot in mono, and a slider to adjust the degree of contrast. Panorama, Cut-out (which takes a shot of a subject then isolates it from the background, making the background black or another photo), slow-mo, timelapse, daft face-filters for kids, text scanner (which actually works really well recognising text and allowing it to then be ported to an app of choice for use or saved as a PDF), Portrait Mode which seems to work as well as any other out there and even YouTube Live for broadcasting via the video function. The Manual Mode enables manipulation of focus, White Balance, Shutter Speed, ISO and Exposure Compensation and even emulates the half-circles of the original Nokia style. Google Lens is baked into the camera for recognition of objects and places, which is improving (slightly) with age! There’s plenty of fun to be had with shooting pictures and video which should keep people, with no designs on printing posters for the wall, entertained. The bottom line on this device is that it’s very nice indeed at the price-point. The choice between X4 (which, significantly for some, has the addition of that excellent wide-angle camera) and this, comes down to whether or not you want 16:9 or 18:9, 32GB or 64GB, an overall smaller form/screen and all-metal/glass construction. They’re now not far off a similar price. The Moto G6 Plus is a more modern-feeling and looking device which seems to fit with the in-vogue way phones are being pushed and is equally, if not more, capable. Going back to the goal here and finally comparing it with the Nokia 7 Plus, it’s very similar in many ways. They are similarly sized, and similarly modern, though the Nokia more boxy in form. The Moto has a better LCD panel and certainly better sound output, but the Nokia is an AndroidOne device and doesn’t rely on Motorola/Lenovo’s lethargic approach to pushing out OS and Security updates. There is a price difference of around £50-75 and which you might consider better value will depend on how you value the two brands and the ‘extra features’ that Moto bundle, along with that better sound output. Personally, I can’t decide. So I’ll keep both!